"For some individuals, privacy may be just as important as a pecuniary consequence," researchers wrote in their paper, which was published last month during the Human Factors and Ergonomics Society 2018 Annual Meeting. "Of course, the combination of both would heighten the potential consequence." Ullman said she doesn't expect her findings will rid the entire world of music piracy. But she hopes to educate the public and to perhaps encourage lawmakers to streamline copyright laws or the music industry to create blanket streaming/download rules that better match consumer habits. Currently, the Copyright Act allows damages of $750 up to $150,000 per infringement. Moreover, under the Digital Millennium Copyright Act, internet service providers can disable repeat offenders' web access. "Technically, there's no music out there that's free," Ullman said, referencing the 2018 Music Modernization Act which for the first time enacts federal laws — that will supersede a vague, contradictory, confusing patchwork of state laws protecting sound recordings — and allow fully-protected music to enter public domain beginning in 2022. She noted that even the "Happy Birthday" song, protected under the vague older laws, didn't enter public domain until 2016 under a judge's ruling; previously, she said, movies and restaurants were among entities that would create their own version or avoid using the song altogether to avoid legal battles surrounding copyright infringement. Throughout history, Ullman said, copyright issues have become an issue whenever there's been modernization; for example, laws had to be created to protect works reproduced after the printing press was invented. "There might be a correlation between our economic condition and how strict (the government or music companies) are with intellectual property. Economic recessions may actually lead to more stringent enforcement with respect to copyright laws," she said. "I doubt these symbols will get someone to suddenly change their mind and say, 'Piracy is bad', " she said. 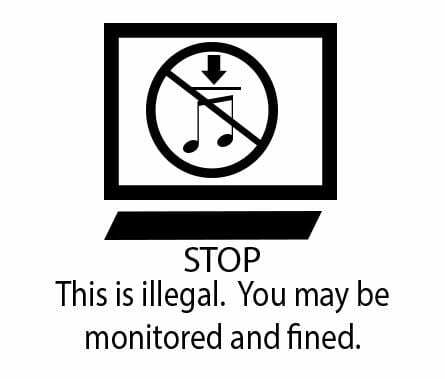 "But at least being reminded that if you download something illegally you may be monitored or fined, we can think about our behavior and make thoughtful decisions. That's especially important in the online world where we're so task-focused; the pictorial can almost immediately remind you — you don't even have to read anything — and make you say, 'I should think before I act'."